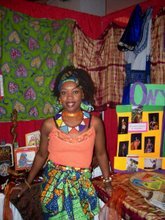 ONYXSTASIA African Diaspora Productions Inc.
My name is Kahmaria, and I'm pleased you are interested in African Dance for Fitness. My classes are for anyone, at any age, and open to men and women. Just come "Shake What Yo' Mama Gave Ya!" My BIO: I trained with Thelma Gibbson(BC) in Caribbean dance, and Eyen-Isong Afrcan Dance studio(BC) and toured with them for 2 years. I have choreography experience with dance group Malaika Saba(SK) and presently coach a student dance troupe at an elementary school(SK). I was an instructor at the YWCA for a year (2004-05) and I hold a Fitness Leadership Certificate(2005). Recently, I choreographed for SCCCA Inc.'s senior and junior dancers for the Afro-Caribbean Pavilion Folkfest -2007(SK). You may have also caught one of my performances at the Francophone Pavilion(2009). WHAT I DO: Instruct traditional African dance classes for adults, teens and a parent-child class. Design Afrocentric Fashions and accessories for women, men, and children. Workshops: for adults, teens, and children. WHERE: STUDIO SANKOFA: Location under construction. Minimum of 15 students required. At Oshun House 912 Idylwyld Drive N.
Not available untill further notice. "Where are Your ROOTS?" Mine are in Africa! Although I am a Jamaican born "African Sista", and I can only hope to someday visit the birthplace of my ancestors; I love the continent from whence I came. Every chance I get to research, or learn something new about my ancestry, I dive right in. I believe it is essential to my exsistence, and my childrens' future to know my history. To reflect this, I design contempory Afrocentric clothing and accessories for men and women. I choose to "WEAR my roots" - a visual statement of the heritage I value and carry proudly in my heart. For this same reason, I teach traditional African dance workshops for children with an educational component about the people, and culture who originally did these dances and why. I also love story-telling in the oral tradition, because it connects me to a small piece of my peoples' way of life; passing on our history through WORD-SOUND-POWER, rhythm and music. Please email me at mailto:onyxstasia@gmail.com for information regarding performance fees and availability.